Located in New York City, the world's first and foremost vertical metropolis, The Skyscraper Museum celebrates the City's rich architectural heritage and examines the historical forces and individuals that have shaped its successive skylines. Through exhibitions, programs and publications, the Museum explores tall buildings as objects of design, products of technology, sites of construction, investments in real estate, and places of work and residence. For a description of the gallery and for photos of the space, please visit our Photo Slideshows page. The Skyscraper Museum is located in lower Manhattan's Battery Park City at 39 Battery Place. Museum hours are 12-6 PM, Wednesday-Sunday. General admission is $5, $2.50 for students and seniors, children under 12 are free. Free for members of the military, police, fire departments, veterans and for visitors who are disabled and their caregivers. Click here for directions to the Museum. All galleries and facilities are wheelchair accessible. The gallery will be closed for installation on May 1 through 3. The book store will be open. Please check our website for updates on gallery hours for May 4 & 5. SKYLINE is a ground-breaking exhibition devoted to the invention and evolution of Manhattan’s skyline, past, present, and future. The exhibition examines the emergence of the collective image of the skyline as the brand identity of New York, but also distinguishes five periods in which new buildings grow and take characteristic forms based on economic, technological, and regulatory factors. Use the interactive sliders to view the skyline from 1902 to the present. Thomas Leslie is the Morrill Pickard Chilton Professor in Architecture at Iowa State University, where he researches the integration of building sciences and arts both historically and in contemporary practice. He is the author of​​ Louis I. Kahn: Building Art, Building Science (2005), Chicago Skyscrapers, 1871-1934 (2013) and, with Jason Alread and Robert Whitehead, Design-Tech: Building Science for Architects (2014). All guests MUST RSVP to [email protected] to assure admittance to the event. Not a member? Become a Museum member today! Click here for more upcoming programs. Are humans the only architects? Come and learn about the types of structures built by animals and how they inspire architect’s designs. Using ideas from these forms children will design and build their own structures. Ages 4-8. RSVP required. The Skyscraper Museum's core exhibits trace the history of high-rise construction with models, videos, and infographics. Displays include a 40-foot long mural on the History of Height from the pyramids to the present, highlighting themes and buildings that relate to the evolution of the skyscraper and point the way to 21st-century supertalls. A special section devoted to the World Trade Center examines its creation as an urban renewal project in the 1960s and documents the rebuilding after 9/11. Case studies also feature the history of construction and models and graphics of the tallest skyscrapers internationally. Trace the rich history of lower Manhattan on its streets or on your computer. The Skyscraper Museum has updated four walking tours, first created in 1996 as Heritage Trails New York, with modern markers adding two new decades of development. Hunt the original markers on the street and read and see the recent history on your mobile device. 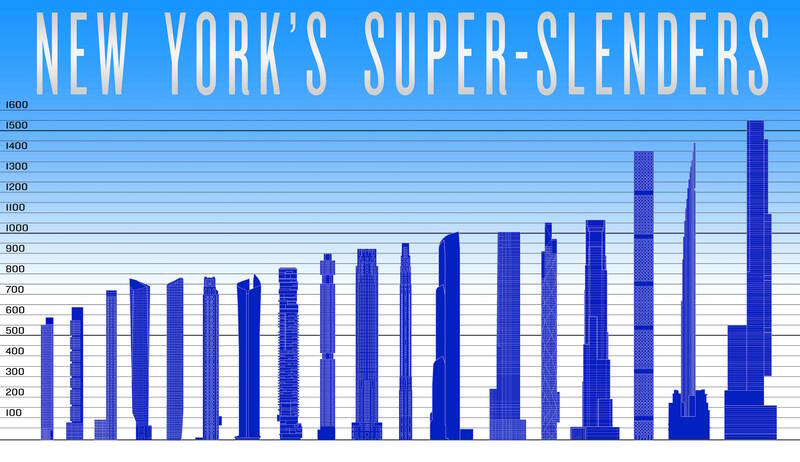 ​The Skyscraper Museum has created a new web project that explains an emerging form in skyscraper history that has evolved in New York over the past decade: the super-slender, ultra luxury residential tower. These pencil-thin periscopes — all 50 to 90+ stories — use a development and design strategy of slenderness to pile their city-regulated maximum square feet of floor area (FAR) as high in the sky to as possible to create luxury apartments defined by spectacular views. TEN & TALLER, an interactive web project, explores the rise of New York's skyscrapers by surveying every building in Manhattan ten stories or taller from the first ones in 1874 through 1900. The Skyscraper Museum collected images and mapped all the 252 buildings, as well as created a timeline of dates of construction. These interactive interfaces allow viewers to see and explore the buildings in innumerable ways. The web projects were launched in conjunction with the Museum's 2016 exhibition TEN & TALLER: Manhattan 1874 - 1900 which is documented in full here. 1939-40 NYC Department of Finance tax lot photographs of the Garment District, showing the distinctive setbacks created by the 1916 zoning law. From left to right: 345-351 W. 35th Street; 347-351 W. 36th Street; 247-255 W. 38th Street. Hilary Ballon. Please click here for a remembrance. The Museum is a participating member of the Downtown Culture Pass.